In the midst of Albert Park’s eclectic architecture, located just off Queens Lane…a colourful summer hideout awaits. Albert Park is now home to an all-new pop-up bar, located in the revamped back alley of the five-star Pullman Melbourne Albert Park hotel. Set to be one of Melbourne’s most Instagram-able bars, Lizzie’s Lane arrives just in time for summer and will be popping up from November 30, 2018 through till April 2019. Operating each Wednesday to Sunday, Lizzie’s Lane offers plenty of London-inspired bites, refreshing summer cocktails, classic UK beverages and chilled tunes. 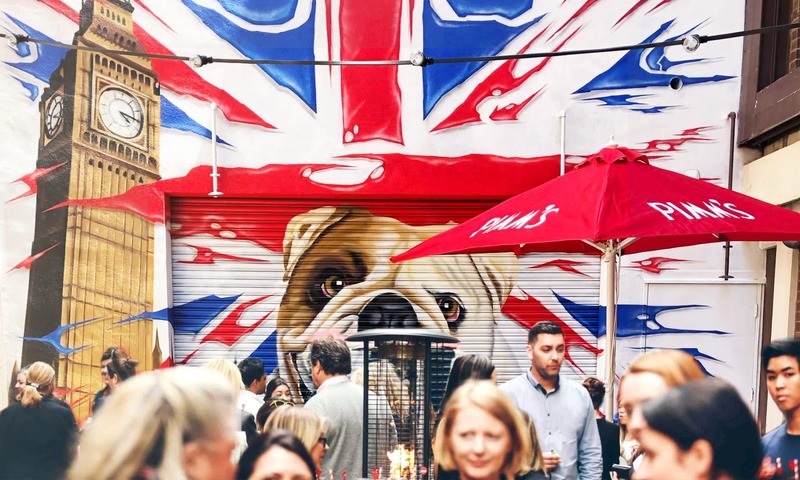 Complete with Astroturf, Pimm’s deck chairs and festoon lights, Lizzie’s Lane is set to be ‘the spot’ for a cocktail, bite to eat or even the odd lawn game this summer. 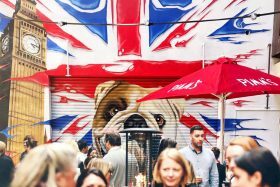 The relaxed garden setting is made complete with a pop-art mural, inspired by a cultural blend between Melbourne and East London, styled by local street-artist, Sheldon Headspeath. After four days of designing, painting, perfecting and drying, the mural was completed, and Lizzie’s Lane was born. The creative cocktail menu of Lizzie’s Lane offers plenty of delicious cocktails, including the traditional Lizzie’s Pimm’s Jug, the Eurostar (D1 London Dry Gin, St-Germain, cucumber, mint), the Hogwarts Express Martini (D1 London Potato Vodka, Kahlua, espresso coffee), and the London Mule (D1 London Potato Vodka, ginger beer, lime), just to name a few. The delectable cocktail menu is of course paired with an equally extensive wine and boutique beer list, allowing Lizzie’s Lane goers to fully immerse in Melbourne’s summer sunshine, partaking in a game of croquet on the ‘lawn’, whilst the garden bartenders create their delicious concoctions! Ideal for private cocktail parties and events, Lizzie’s Lane has been designed with celebrations in mind. Available exclusively, with bookings for up to 130 people, Lizzie’s Lane is the perfect venue for a uniquely Melbourne experience. From stand-up cocktail functions, launch events, sit down dinners, picnics, local exhibitions and everything in between, Pullman Melbourne Albert Park’s dedicated Conference and Events team will bring your vision to life. Guests visiting with a group will be able to share a delicious platter and choose from a variety of options including, warm rare roast beef rolls, fried onions, stilton and beef fat béarnaise with horseradish-seasoned fries, or prawn cocktail rolls, complete with watercress and lime, or even Wagyu cheeseburgers with dill pickle, English cheddar and house-made relish. Alternatively, guests can choose from an assortment of nibbles including buttermilk spiced chicken pops with smoky bacon dip, salted cod croquettes with smoked aioli, or fully indulge with a ploughman’s platter, perfect to share with friends, the platter includes smoked ham, piccalilli, pork & chicken terrine, aged English cheddar and freshly baked sourdough. Lizzie’s Lane will be open each Wednesday to Friday from 3pm until 9pm, Saturday from 12pm until 9pm and Sunday 12pm till late, and is located at 591 Queens Lane, Albert Park.